PM Narendra Modi on Monday invoked Atal Bihari Vajpayee’s concepts of communal harmony, humanity and democracy to share the pain of Kashmiris and promised to take the state to new heights of development. “People of Kashmir have given me a lot of trust and love. I will repay this love and trust with interest in the form of development. I can die for this love and trust showered on me,” he said in his first election meeting in the Valley. In his 30 minutes speech, Modi used the opportunity to attack the all pervasive corruption under successive governments of “Congress, father-son and father-daughter” in the last 30 years and asked the people to give him one chance to bring development. Wearing a traditional Kashmiri ‘Pheran’, Modi sought to strike a chord with the people saying “I as Pradhan Sevak have come to share your pain and anguish. Your sorrow is my sorrow, your pain is my pain, your problem is my problem. I have not come to take anything. Three days after the deadly terror attack that killed 11 security personnel, Prime Minister Narendra Modi on Monday said a finger pressed on an EVM is more powerful than the one on an AK-47 trigger as he asked the people of Jammu and Kashmir to give a decisive mandate to BJP. Modi also said the resettlement of displaced people is a national responsibility and his government will ensure that those who have been displaced are rehabilitated. “The finger pressed on an EVM is more powerful than a finger pressed on the trigger of an AK-47,” Modi said addressing an election rally in Samba on Monday. Modi’s visit comes just three days after a deadly terror attack in Uri by Pakistani terrorists that killed 11 security personnel including an Lt Col of the Army. Modi said the misguided youth are now feeling the burden of an AK47 and craving for Android 1, a platform for mobile phones. He also hit out at what he called the “dynastic rule” in the state and said that J&K needs a stable government. “You have seen the rule of the father and son. You have seen the rule of the father and daughter. Have they done anything for you?” he said in an indirect reference to National Conference and PDP rule. 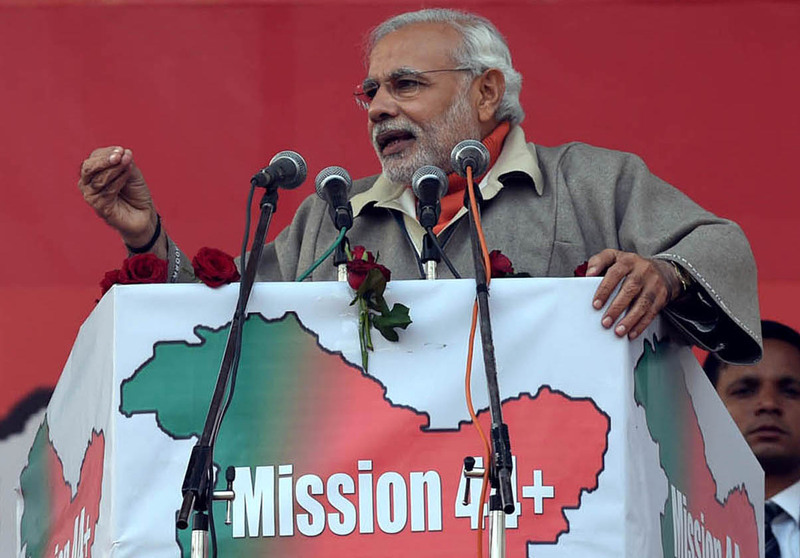 There is a need for a majority government, a BJP government in J&K, he said. The Prime Minister said that the youth of the state needs employment and development, which only BJP can give.